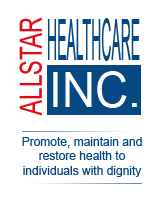 Allstar Healthcare, Inc. considers applicants for all positions without regards to race, color, religion, creed, gender, national origin, age, disability, marital or veteran status, sexual orientation, or any other legally protected status. ALL FIELDS ARE REQUIRED. ENTER "N/A" FOR BLANK FIELDS. YOUR APPLICATION WILL NOT BE COMPLETED UNTIL YOU CLICK THE SUBMIT BUTTON. DO NOT USE THE BACK BUTTON. ALL DATA ENTERED WILL BE LOST. If Yes, when did you apply (date)? If Yes, when did you work for us (date)? When will you be available to work (date)?